I've been meaning to blog about this for over a month (whoops! ), but I somehow failed and I swear October lasted like 10 minutes! Anyway, Ralph and a friend of ours really wanted to go to the first ever Malaysia Vapefest, which was held at Putra Walk, Seri Kembangan on Sept. 20–21, so I went with them. We had never been there before; we took a wrong turn and got lost along the way. I love getting lost, it's just another way of saying 'going exploring.' Haha. When we went there on Saturday, there were less than thirty vendors selling electronic cigarettes, vaping accessories and a wide variety of e-juice flavors, including blackcurrant, honeydew, cotton candy, peppermint, coffee, butterscotch, etc. #11 Plumes of vapor were everywhere, but it smelled sweet and dissipated immediately into the air. More and more people have now switched to a safer, cleaner and healthier way to replace the cigarette addiction by picking up less harmful e-cigarettes instead. What's also fascinating about Vapefest was that it was largely male-dominated. Whilst Ralph mingled with other fellow vapers, we looked lost and out of place. He then introduced us to some interesting and friendly people, which was nice even if we don't share the similar interest. Just right after supper at PappaRich, we stuffed ourselves again. Oh jeez, loll. #13 Yum, it's been a while since I had grilled lamb chops! #15 I'm still fantasizing about the succulent, juicy, perfectly barbecued chicken wings I had. #16 As for the baked potato, it was superb in my opinion. #18 Thank you, Ralph's friend (forgot his name) and Barbarian Grill for inviting us to join them and feeding us tasty barbecue! It'S the month of October and you know what that means - Oktoberfest! Well, so in other words all around oom-pah-pah music, chicken dance, Dirndl girls, German food and of course, BEER. #1 Everyone seemed to be having a great time and so did I! #2 The epic three-day grand finale party was back again at 1 Utama's Old Wing outdoor car park and we were there almost until midnight last Sunday. #6 I'm watering at the mouth just thinking of the deep-fried chicken (RM10)! My belly was sated by traditional German fare, and delicious German beers quenched Ralph's thirst. 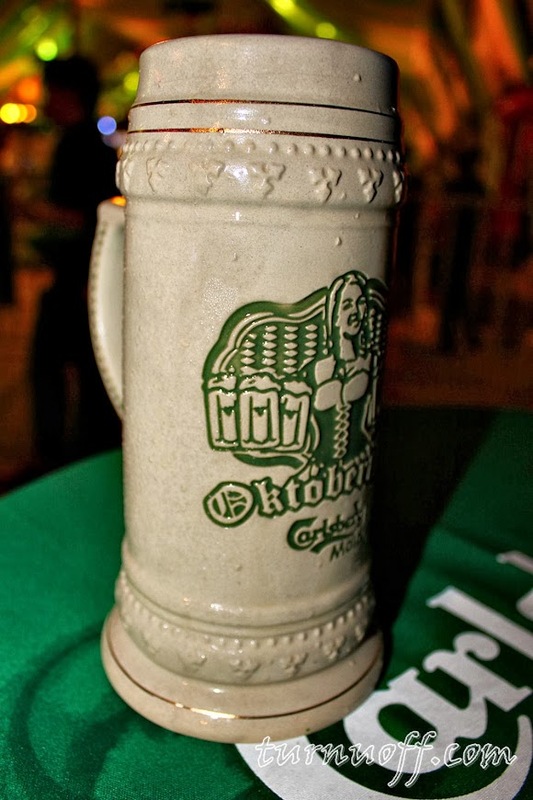 #7 The beer was served in a collectible rugged-style stein that we could take home to add on to our Oktoberfest collection. #8 Other imported German beers such as Erdinger, Franziskaner and Lowenbrau as well as Carlsberg were also available. #9 Ralph played "Street Cobra", a strength testing game in which he got 2 Oktoberfest felt hats, woohoo! My favorite part about Oktoberfest is the lively music. #11 Similar to previous year, a six-member Oom-Pah-Pah band was flown in from Germany to rev up the crowd. They played traditional favorites at first and it was quite loud, which sometimes made conversations a tad challenging, but which proved awesome when everyone sang and danced together and the whole place reverberated with merriment! #18 Charming girls in dirndls performed the "chicken dance" along with Oktoberfest partygoers. 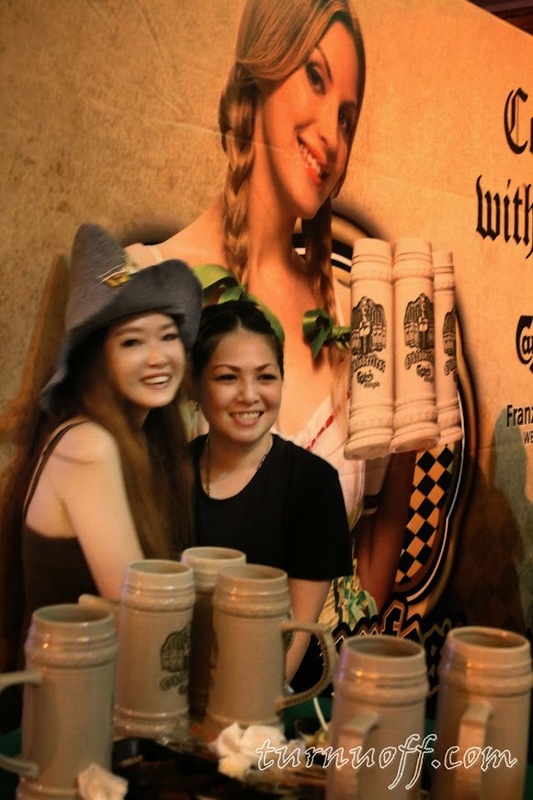 The crowd's participation and enthusiasm is one of the key attributes to Oktoberfest. Happy vibe all over in the huge beer tent and we made many new friends! #26 Prost! Prost! Prost, y'all!